This early 20th century memoir of a woman’s faith in the face of debilitating disease is a “remarkably un-self-pitying book remains poignant and truthful” (Publishers Weekly). In 1895, a specialist straps five-year-old Katharine Hathaway, then suffering from spinal tuberculosis, to a board with halters and pulleys in a failed attempt to prevent her from becoming a “hunchback” like the “little locksmith” who does odd jobs at her family’s home. Forced to endure her confinement for ten years, Katharine remains immobile until age fifteen, only to find that none of it has prevented her from developing a deformity of her own. 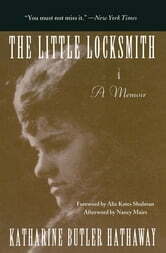 The Little Locksmith charts Katharine’s struggle to transcend physical limitations and embrace her life, her body, and herself. Her spirit and courage prevail as she expands her world far beyond the boundaries prescribed by her family and society: she attends Radcliffe College, forms deep friendships, begins to write, and in 1921, purchases a house of her own that she fashions into a space for guests, lovers, and artists. 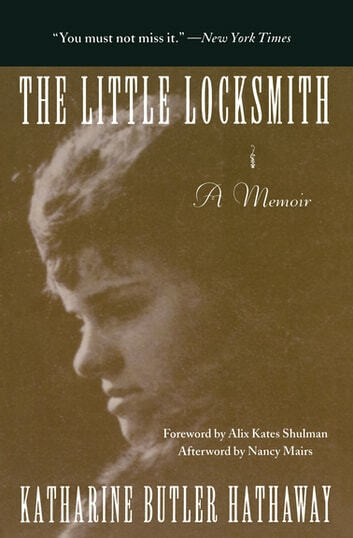 Revealing and inspirational, The Little Locksmith stands as a testimony to Katharine’s aspirations and desires—for independence, love, and the pursuit of her art.